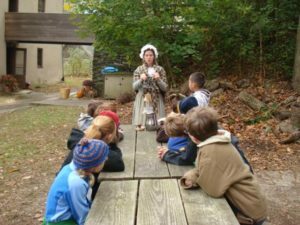 Colonial Living is a living history program provided to all fifth grade students attending public schools within Haverford Township School District. 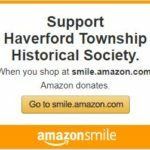 This unique and award winning program is run by the Haverford Township Historical Society in partnership with the school district. 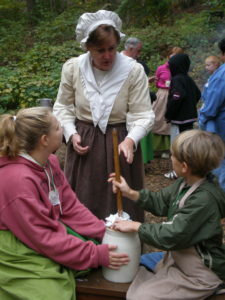 Students at Colonial Living spend a day doing some of the chores and activities that early 18th and 19th century children did long ago. Colonial Living takes place at both Nitre Hall and Lawrence Cabin, which allows students the opportunity to compare and contrast lifestyles between the centuries. 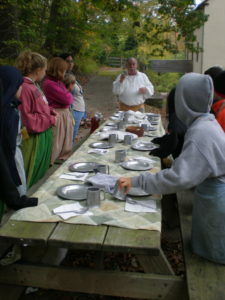 The costumed students are all hands on when it comes to sawing and splitting wood, preparing a noon day meal, churning butter, hauling water in wooden buckets, and dipping candles. 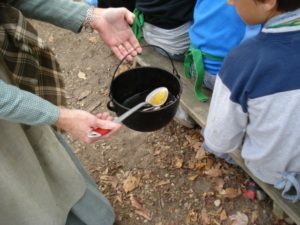 They enjoy helping with open hearth and cast iron stove cooking, a soap making demonstration and picking herbs from the herb garden. 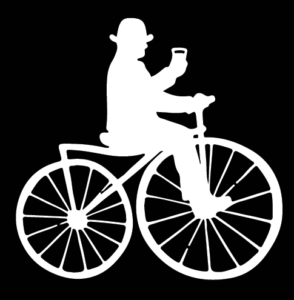 The day is capped off with tours of both Nitre Hall and Lawrence Cabin. That butter is churned from cream? That churning time is greatly influenced by the air temperature? That buttermilk is the byproduct of the butter churning process? That candles were made from beeswax, tallow, spermaceti, or bayberries? That it takes about 60 dips to make a decent sized candle? That candles dipped in a copper pot take on a pale green patina? That simple soap is made from beef, pork or lamb fat, lye and water? That simple soap is very good for removing grass and dirt stains from clothing? That simple soap starts out white and turns brown as it ages? That wooden buckets leak until they’ve absorbed enough water to swell the wood? That water buckets were carried on wooden yokes straddling the shoulders? These are a very few of the “fun facts” the children at Colonial Living learn.